Oakland, New Jersey, November 21, 2012 – Consiliant today announced that Michael (Waz) Wasilewski, Director of North East Sales and Operations lead the charge in saving a rafter of wild turkeys the day before Thanksgiving. These unsuspecting birds were in harm’s way and the target of an unknown aggressor. 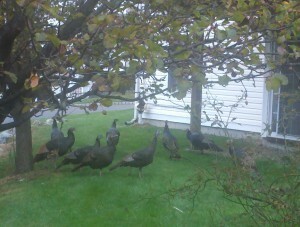 We commend Michael for his unselfish acts of kindness in saving these beautiful wild turkeys from the dinner table.